I am a mom of four boys who are not always easily amused. Apparently they did not inherit my ability to entertain myself. Because of this, I am always searching for new toys and ways to keep them engaged and entertained. Electronics are fine, but what you really want as a parent is something that gets your children's imaginations going, and lets them be creative in their play. The all new Zoomer Dino is the hottest thing to hit the toy market all year, and I predict is will be one of the most sought after toys of the holiday season! Basically, Zoomer Dino is a remote control dinosaur, but it is not enough to call him that. Using the latest technology, Spin Master Toys has create a toy that moves and reacts like a real dinosaur. He comes to you with a wild nature, and through exploration and a whole lot of fun, kids can learn how to tame and even train him. With multiple modes for play including a free range option where he controls himself, a joy stick and hand controls, it is easy to see how the Zoomer Dino has kids intrigued with its electronic capabilities, and moms happy with its ability to get children to use their minds through exploration and imaginative play, and we didn't even mention the coolest part. His feet! Zoomer Dino does just that, he zooms through your house at high speeds with two balls as his feet. He is cooler than a Dyson! When Zoomer Dino arrived at our door for us to test out, my youngest couldn't wait to open the box. Of course, the cats had to get a few good sniffs in first. Jase's face when he first lifted Boomer the Zoomer Dino out of the box was priceless! He had just seen the display in Target and had been begging for one, so he was super excited to get to play with his new dino friend. Him and his brother Jayden checked out Boomer's mood chart. The chart explains what the Zoomer Dino's mood is according to the color of his eyes. For the moment, Boomer's eyes per green and he was happy, but as the boys played with him, they flickered to blue for curious, purple, which meant his was in manual command mode, and even red when he got angry. The boys quickly found the the Zoomer Dino can be rather unpredictable at times. He has to be tamed and trained over time and play, before that, he does what he wants sometimes, and for us, this included chasing the boys, cats, dogs and occasionally falling on his face. Of course, the boys found all of these actions hilarious. Want to see Zoomer Dino in action? Check out this video my oldest son made! Boomer the Zoomer Dino is a ton of fun, and I would highly recommend him for any child's Christmas list this year. Because his controls are a little more difficult than a general remote control toy, I would say that if you want the child to use it properly, ages 6 and up would be great for Zoomer Dino, but younger children can still enjoy watching Boomer the Dino do his own thing too. 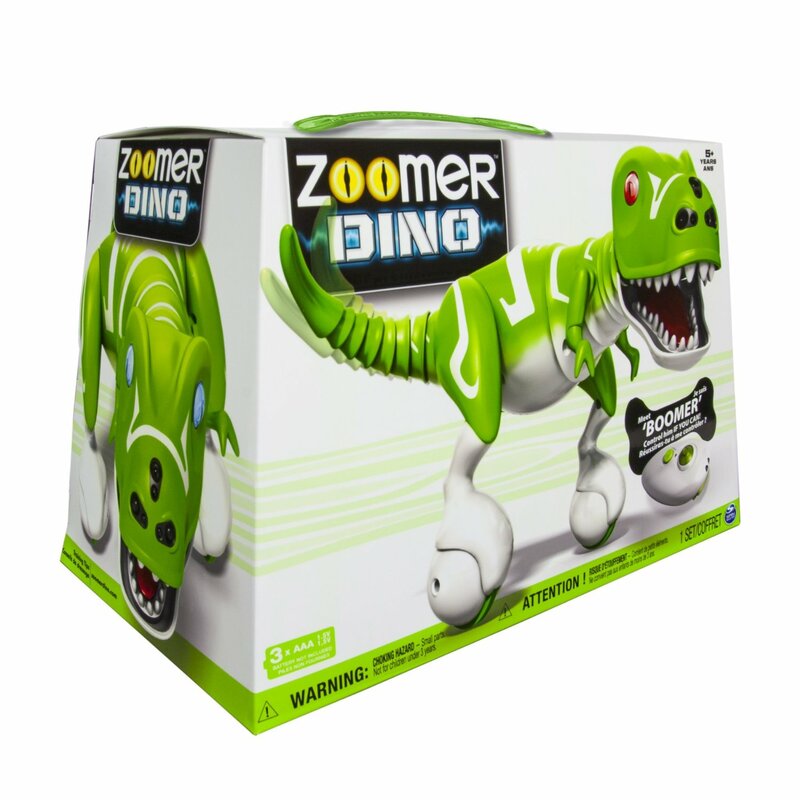 Zoomer Dino is available online, and at retailers nationwide now, and retail cost is $99.99. For more information, you can visit ZoomerDino.com.